Walking dogs to a dog park near the Schuylkill River. Do you ever wish you could date others who loved your dog as much as you? Well, there’s now an app for that. Dig is an up-and-coming dating app you can use to meet other dog lovers. “It’s imperative to find someone compatible both with you and your dog, so we want to make it easier to find someone the two of you really ‘dig’,” said Casey Isaacson, Co-Founder and CCO of Dig. 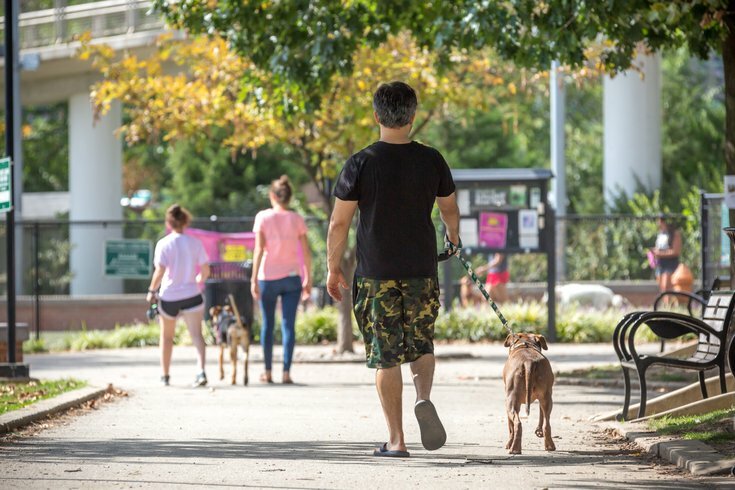 Now available in Philadelphia, Dig is for dog owners and dog lovers alike, so even if you don’t own a dog, you can still use the app with ease. “You can search for someone with a dog or without a dog (because we know not all dogs get along – or maybe you want to find someone you can get a puppy with in the future)," Leigh said in a news release. There’s also a feature within the app to filter by dog size, just in case your little chihuahua gets easily riled up and protective of dogs three times their size. Dig is currently available in Philadelphia and there’s more than several thousand people already signed up in the area, Leigh confirmed. The app officially launched in February 2018, and while there isn’t a launch party planned for Philly just yet, Dig assures they are planning to have one sometime by the end of the year. Dig is available for iPhone in the app store.